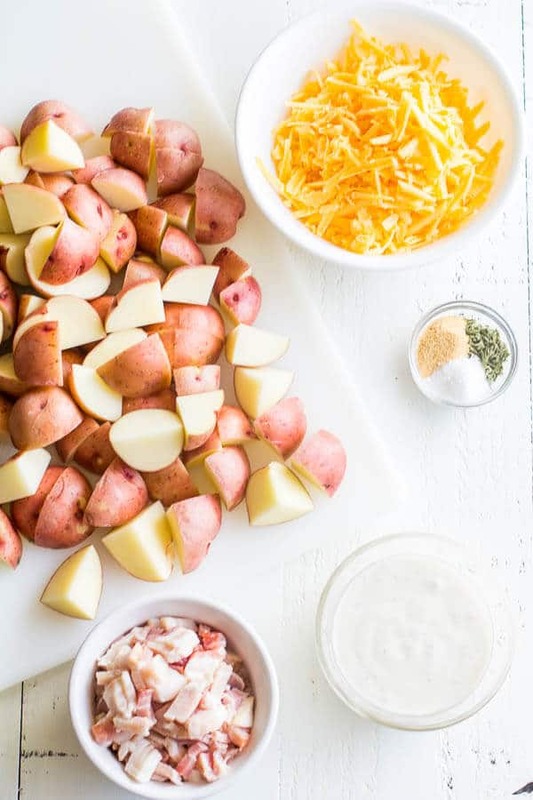 Bacon ranch potatoes in less than 30 minutes! AND only 4 main ingredients and 3 simple seasonings for this mouth-watering comfort food. Anyway, since no pressure came out, I was nervous to open the lid inside. So I carried my instant pot out to the backyard. If it explodes, let it be outside, right? And why wouldn’t I snapchat the whole process too, thinking I may be able to capture a crazy explosion or something. Well, I held my phone in one hand and carefully opened the pressure cooker with other. And guess what? Nothing happened! No explosions, not even a steam. And the potatoes were barely cooked. Bummer!! Lesson here is that to cook something in pressure cooker, you need LIQUID! Duh, face palm, after reading the handbook! But if you use recommended 1 cup of water, your potatoes will overcook and you’ll get mashed potatoes instead. April 16, 2018 UPDATE: My original recipe called for only 2 tablespoons of water, and it worked with my original (now discontinued) version of Instant Pot, which didn’t have any “burn” warning. However due to number of readers’ feedback about “BURNT” warning, I purchased a new Instant Pot and reworked the recipe. I tested the recipe many times, and found 1/3 cup of water is perfect amount. 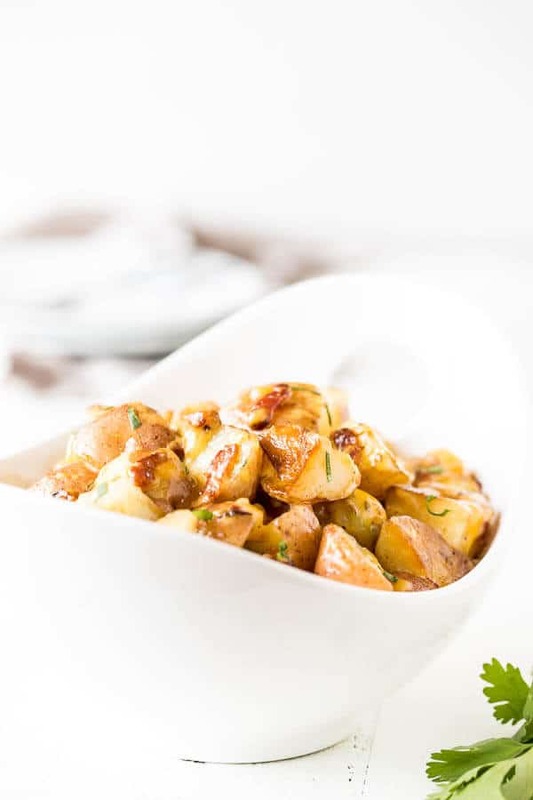 The pressure cooker comes to pressure just fine without any warning and cooks the potatoes perfectly. More water overcooked the potatoes. So, what makes this recipe so special? Only 4 main ingredients and 3 simple spices for this mouth-watering comfort food. I mean, bacon and potato alone will sell this recipe. But when you throw cheese into the mix, it’s simply hard to resist! And the best part, everything is cooked in one pot! Super simple, yet unbelievably tasty dish in less than 30 minutes. Do you have Instant Pot, or similar electric pressure cooker? What’s your favorite dish to cook in it? I’m slowly building my favorite pressure cooker recipe list, and I’d love to try your favorites too. Cut the potatoes into about 1-inch pieces. Set the Instant Pot to “Sauté” and add bacon. Cook until nice and crisp. Stir in potatoes, dried parsley, garlic powder and salt. Set the Instant Pot to Manual for 7 minutes at high pressure. Do quick release the pressure and carefully open the lid. Add ranch dressing and cheese and stir to combine. Serve immediately. Made this tonight after a tough workout and it hit the spot. Sooooo easy, especially since I used already cooked and crumbled bacon from Costco. This is definitely going to be a go-to for our family. So glad you loved these potatoes, Jayn. Thank you for your feedback! I followed the recipe, and before my IP could come to pressure, I got a burn message. When I opened the lid to sort it all out, I found my potatoes were cooked perfectly! 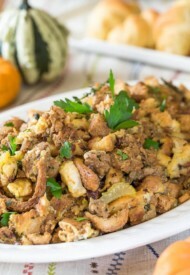 I followed the rest of the steps from the recipe, and my family loved it! So glad it turned out for you, F! Thank you for your feedback. Made this for my family the only thing I changed was I used Greek yogurt ranch to cut the calories, family approved. Yay, so happy you tried and loved these potatoes! Thank you for your feedback, Leesa! I was just wondering the same thing, as I’m trying to lose weight. Did you change the amount of water used for this recipe? It’s my understanding that the IP required at least 1cup of liquid to come to pressure properly. Perhaps that’s why do many people had an issue with burning potato. I never make recipes calling for less than that. I would suggest rereading the IP handbook. Hi, Linde. Thanks for the note. You’re correct, manual does state minimum of 1 cup of liquid. However, my recipe was developed almost 2 years ago with an original version of Instant Pot (now discontinued model), which didn’t have “burn” warning. And my original recipe called for only 2 tablespoons of water, which worked perfectly in that old model. Since then, due to readers’ feedback, I purchased a new model of IP, and reworked the recipe. Through my numerous testing, I found 1/3 cup of water was enough to bring IP to pressure and cook the potatoes perfectly. More water (1/2 cup of water) overcooked the potatoes, making a mashed potatoes instead. I understand your hesitation though, and I’ll leave it up to you to try it or not. If it helps, here’s a quick video tutorial. Great dish! I was in the home stretch when realized I had no Ranch 🤔 I was able to sub in Ceaser. I dropped in some croutons to add a little crunch. Thx for your inspiration! Mmm, that sounds great! Thanks for sharing your twist and feedback, Mike! Recipe cause the burning alarm to go off on my instant pot ultra. Add more water ended up with soggy potatoes. Hi, Diana. Sorry yours didn’t turn out. I ordered a new version of Instant Pot the other day, and will re-test and improve the recipe soon. I appreciate your honest feedback. Did not come to pressure, burnt on bottom of pot, just a huge mess. Hi, Doris. Sorry about the mess. But thank you for your feedback. First, I have the 6 q Instant Pot Ultra 10-in-1. Second, I scanned those directions 😱. I added the Ranch Dressing with all the other ingredients to my bag of cut up Little Potatoes (red). I used Costco bacon that is precooked but I only added 2 tbsp of water as directed. I also added the cheese too 😱 but got most of it out when I read the directions more carefully. I should have read comments as well! How did it turn out? When I went to check on it – the display said BURN! But actually the potatoes were perfect – I added cheese and it was ready! The pan did require some extra scrubbing however! Hi, Janna. So glad that the potatoes turned out well despite the changes. 🙂 Thank you for your feedback! I made this tonight. The flavor is delicious but I’ll cut my potatoes smaller next time. Most were still too crunchy. Love the flavor though! Did not work for me. First time, did not come to pressure. Added more water & tried again. Came to pressure & cooked ten more minutes. Still not done. I threw it all in my big cast iron pan & cooked. Hi, Lori. Sorry to hear yours didn’t work out. But I appreciate your feedback. I will make this several times a month better than potatoe salad! Year around. 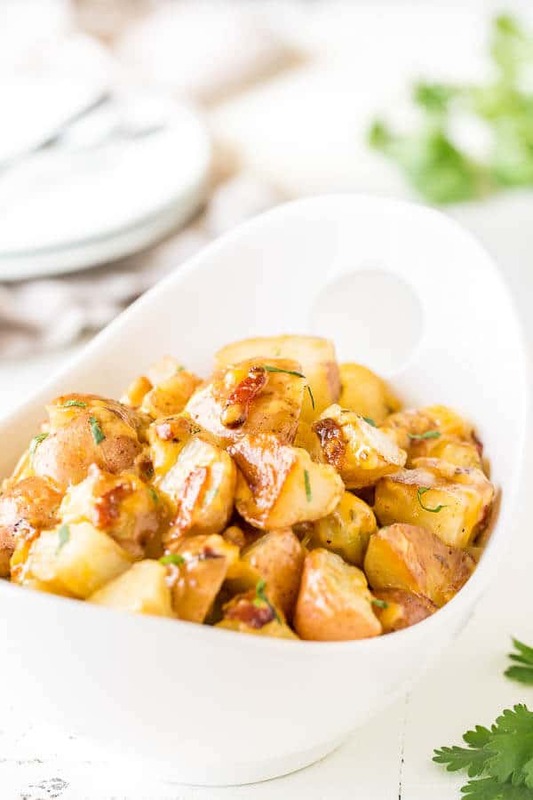 Hi, I’m new to using my Instant Pot, this is the second recipe I’ve tried… I tried this and the potatoes burnt to the bottom. When I turned on the IP and started the cooking process, a few minutes in I got an error message that said “BURN.” I stopped it and scrubbed the bottom and added a bit of olive oil, but I got the same result. I have an 8qt and we added 4 TBSP of water and followed the instructions exactly. Any tips? I’m sure this is delicious and I’d love to try again. Great recipe! This was my first time cooking with the Instant Pot, and it turned out great. I cooked these in the 3 qt pot and used the same amounts of ingredients and times. Thanks for sharing this recipe. I’m an Instant Pot fanatic now! Hi, Tony. So glad you loved the recipe!! Thank you for your feedback. 1/3 cup powdered ranch mix or like the creamy bottled dressing? Hi, Rhonda. You’ll need creamy bottle dressing for this. I add onions and bacon together on saute. Then potatoes an seasoning, add more water and doubled time on manual. Seasoned to taste when finished added last of ingredients. Served with sour cream. Everyone loved it! Michelle, thank you for your feedback and sharing your adjustments. Glad to hear everyone loved it! Could I double recipe? Make 4 lbs of potatoes at a time? How much water with raw bacon and a 6qt? Hi, Jenean. I’ve never tried doubling the recipe, but I don’t see why you couldn’t. 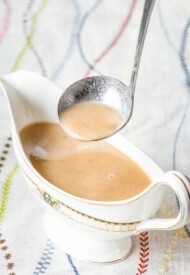 Just double everything, including the water amount, which would be 4 tablespoons, or 1/4 cup. It was a success! I cut the potatoes about 1″x 1/2″ and 2.5x the recipe. (5lbs of russets). i used about 1/4 c water or so just in case and let it warm up while I finished putting everything inside. I even took a rest before the potluck so when I came back it was on warm and had done a natural release. As I slowly mixed in the cheese and ranch dressing, the potatoes started to become creamy and ended up like chunky mashed potatoes in a way. I had at least 4 people ask me what was in it, they really liked it! Yay, I’m so glad it worked out, and that everyone loved it. Thanks for reporting back on how it turned out, Jenean! Oh no, I’m so sorry to hear that, Tina. Did you use thick-cut bacon, or thin? I should have specified in the recipe that I use thin cut bacon, and I cut it into tiny pieces. And how small were your potatoes? I make this on the regular and it always turns out fine. I did use thick cut bacon. The potatoes I cut in chunks. Not really sure how to describe the size. I have always made ranch potatoes in the oven, but they take forever, so II figured I’d try this version. I’m just starting to get the feel for my instant pot, as I haven’t had it for very long. I just ended up dumping everything in a baking dish and broiling it for half an hour.. then covering it with cheese. I didn’t add the ranch dressing. So in a way I saved it. Just wasn’t what I was expecting. I hope you’ll give it another try. I’d suggest next time try cutting the bacon smaller and potatoes bigger. I usually cut my potatoes into about 1-inch cubes. Once you get hang of your instant pot, you’ll love it. And thanks for your feedback, Tina. I was super surprised to read only 2 tablespoons of water. And sure enough, it did not work at all for me; the pot never came to pressure. So when it started counting down without being at pressure, I opened it up and sure enough there was no water in the pot and all my potatoes had burnt to the bottom. So I emptied them all out, scrubbed out the pot and used 1/2 cup of water. Worked perfectly. The potatoes weren’t soggy. There was probably a tablespoon of water left in the pot at the end but it had some colour to it from the food so I just left it in when I stirred in the cheese and ranch and it was fine. Based on other people’s feedback, it’s my understanding that bigger Instant Pot requires more water. So I’m hoping to hear that yours is 8qt Instant Pot, and 1/2 cup of water is what it needs. Thanks, Chris, for your feedback! Oh, that’s quite weird. I don’t think mine is DUO, and I have no idea what could be the difference. I’m so confused now. The Duo has the yogurt setting, lid holder in the side handles, and has a low pressure setting as well as high. The Lux doesn’t have that. I can’t see one needing more water than the other though if they are both 6 quart models. Type of potatoes? Maybe mine soaked up more water? No idea though. Can’t say I’ve heard using that little water for any recipe though until I read your blog. I have a thought! My bacon wasn’t raw; I used some cooked pieces we had leftover from breakfast. And we cook our bacon very well so there would’t have been much fat released at all. Oh that is it, Chris. My husband mentioned about cooked bacon, but I brushed it off, saying I call for raw bacon. Haha Now we know the mystery. And thanks for letting me. Making these right now (my first time using my Instant Pot!). I have precooked bacon and I was worried about how the lack of moisture from the bacon grease would affect it, do I just added some butter. We’ll see how it goes! Hey, Kate. Sorry for delayed response. How did it turn out? I know I’m too late now, but I’d have suggested adding a bit more water instead of butter. In your notes, you say increase the water, yet in the recipe there is no liquid mentioned. Hi, Sheila. I don’t list water in ingredient list, as it’s something readily available. But the amount is specified in the direction. (Step #3). This recipe was a success for me! I have a 5 qt and needed to do 3 lbs red potatoes so I followed the recipe as written and added 3 TBSP of water and set it on Manual, high pressure, for 12 minutes. I divided the potatoes and did 1.5 lbs at a time. The recipe forgot to mention the garlic powder so I just mixed it in with the parsley and salt. Hi, Dawn! Yay, so glad the recipe worked for you! I heard back from one of the commenters below, who confirmed that hers was 8Qt Instant Pot. So seems like size of the pot affects the cooking time. I’ll update the recipe accordingly. I also edit it to add garlic powder (Totally forgot it. Oops!) I really appreciate your feedback. Thanks for the idea. I have the Instant Pot and I had to cook mine for 10 additional minutes so 17 total because the potatoes’ were not cooked. I also added 3 tbsp more water for the second round of minutes. Thanks, Kymberly, for your feedback! It’s very strange, but I really want to find out why the cooking time varies so much. I’m wondering if the size of the Instant Pot makes any difference. Mine is 6Qt, what size is yours? Just tried this in my ip. I followed the directions exactly but they were nowhere near done after 7 minutes on manual. I added two more tbsp. and put it on for another 7 minutes….still not done. Then I used the steam feature for 5 minutes and they still werent done. What in the world could possibly be the problem? Hmm, so weird, Brandy. But thank you for your feedback. I wonder if the size of Instant Pot make any difference? Mine is 6Qt, what size is yours? Just tried the recipe as described above in the instant pot. Got an overheat warning. Are you sure 2 TBSP water is enough? Do we need to put it on any kind of elevating rack/steaming insert? Hi, Dave. That’s interesting. I’ve tested with amount of water, and found that more than 2 tablespoons of water make the potatoes mushy. I’ve never had that warning though, and I didn’t use any elevating inserts. Just want to confirm, you’re using Instant Pot brand, right? I have 2 electric pressure cookers, Instant Pot and Fagor. And this recipe was made/tested in Instant Pot only. My Fagor has 2 settings, high and low pressure. And I tend to burn most of my food on high setting in Fagor. Would it be possible to freeze this ahead of time? Hi, Kendra. Sorry for late response. I wouldn’t recommend freezing it. Looks really good! Question! What do I do if I don’t own a pressure cooker? 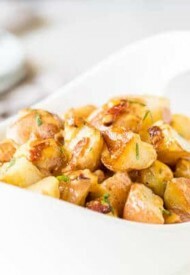 :(( hubby loves potatoes and I’m always looking for new recipes, really want to try this one! Hi, Olya! Before pressure cooker, I used to make it in the oven. The method would a bit different, and it takes longer. 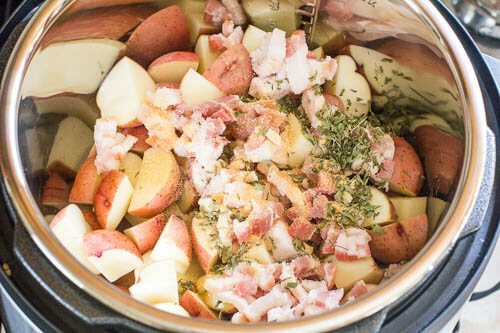 You’ll cook the bacon separately, bake the potatoes with seasoning for about 45 minutes. 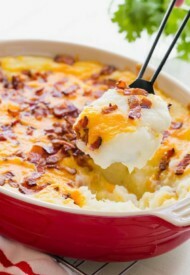 And then once potatoes are cooked, stir in the ranch dressing, cheese and bacon. Let me know how it turns out, if you try it.